The year was 1955 and Fred and Rosemarie opened the first Grand Apizza neighborhood Pizza Palor in the town of Fair Haven CT. Over 60 years later the tradition is carried on by Fred and Rosemarie’s three sons with Grand Apizza of Bethany CT, Grand Apizza Shoreline in Clinton CT, Apizza Heaven in Sedona, Arizona, Apizza Grande in North Haven and Apizza Grande East Haven CT. We are located at 400 Coe Avenue in East Haven CT.
We make the finest Pizza, salads, subs and calzones. Our Family recipes have been past down and include lasagna, manicotti, egg plant parmigiana and more… We have a wide variety of pasta with over 10 different sauces. We can provide catering for any occasion. No matter if its 1 to 200 peoples. 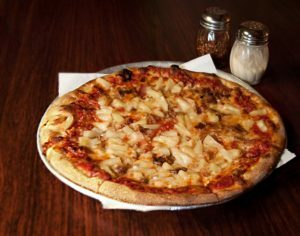 Call or stop by today and experience pizza from one of the first families of New Haven.